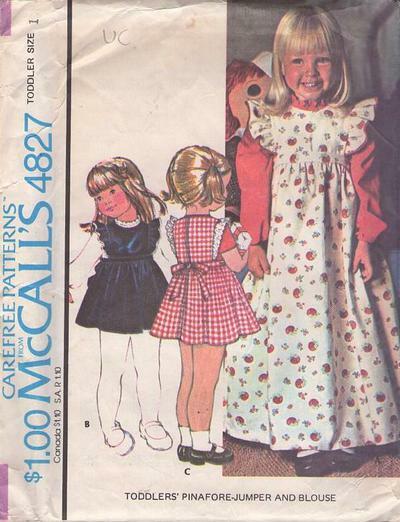 1975, 70s Children, Retro Toddler Clothing Patterns - Toddler Girls' Pinafore-Jumper and Blouse. Pinafore-Jumper A, B, C has lined bodice, back zipper, tie belt sewn to waistband. A, B has fabric ruffles and trimming. C has ruffling. Blouse has neck ruffle, zipper in back opening, long sleeves with elastic in wrist casings.